Antibacterial personal care products can play an essential role in our daily lives by safely and effectively removing germs and helping us to stay healthy. Consumer surveys are a helpful tool for evaluating how people across the country want and use antibacterial products in their daily lives. A new poll finds that the vast majority of Americans uses antibacterial soap and finds it to be a useful tool to prevent the spread of germs. And two-thirds of Americans would be “angry” at any government attempts to ban the products. The poll, released by the American Cleaning Institute and the Personal Care Products Council, reports that 83% of consumers should have the choice as to whether or not to purchase these products. The poll, completed by the Fabrizio, Ward and Associates, sampled 1,000 adult Americans (age 18+) that were interviewed by telephone from December 5-12, 2010. Harris Interactive observed the behavior of 6,028 adults who appeared to be age 18 and older in public restrooms located at major public attractions in the U.S. and recorded whether or not they washed their hands after using the facilities. Researchers returned to six locations in four cities where two previous studies were conducted: Atlanta (Turner Field), Chicago (Museum of Science and Industry, Shedd Aquarium), New York City (Grand Central Station, Penn Station), and San Francisco (Ferry Terminal Farmers Market). "The message is that people are getting the message," said Nancy Bock, ACI Vice President of Consumer Education. "Between mom’s common sense advice and the recent pandemic scare, people now seem to realize the importance of when and how you wash your hands." The survey questions were asked of 1,008 American adults (500 men and 508 women). 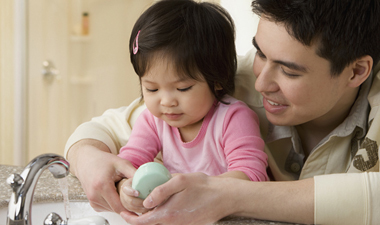 The independent consumer research study was completed February 25-28, 2010 on behalf of The Soap and Detergent Association (SDA) by Echo Research. The survey has a margin of error of plus or minus 3.1 percent. Results showed that Consumer confidence in the cleaning products they use every day remains strong. A complete summary of the survey statistics is available here. The Report Card is based on a series of hygiene-related questions asked of 888 Americans during a telephone survey conducted in August 2009 by Echo Research. Results showed that Americans appear to be embracing hand hygiene more than in past years. However, not all of us are cleaning our hands as often as we should – especially with the threat of the H1N1 flu virus (a.k.a. “Swine Flu”). "The H1N1 pandemic is real. Cold and flu season is on its way. With common sense hygiene practices, good health is literally in our hands," said Nancy Bock, SDA Vice President of Education. "Now is not the time to let our guard down when it comes to cleaning our hands," added Bock. The SDA National Cleaning Survey was completed for The Soap and Detergent Association by Echo Research (ER). ER questioned 1,008 American adults (504 men and 504 women) via telephone in May 8-11, 2008 on whether they had ever used a wipe product. Subsequent questions were asked among 693 American adults who did indicate wipes usage. The survey has a margin of error of plus or minus 3.1 percent. More than eight out of ten Americans recognize that the cleaning products they buy are safe when used as directed, according to a survey for The Soap and Detergent Association (SDA). Among 1,013 adults surveyed for SDA by International Communications Research (ICR), a strong majority believe the cleaning products they use are “very safe” (27%) or “safe” (58%) when used as directed. Nearly nine out of ten Americans believe the cleaning products they buy are safe when used as directed, according to a survey released by The Soap and Detergent Association (SDA). Among 946 adults (451 male, 495 female) questioned by International Communications Research for SDA, an overwhelming majority found cleaning products to be "very safe" (40%) or "somewhat safe" (48%) when properly used. Eight percent said these products are "somewhat unsafe." Less than one percent said cleaning products are "not safe at all" when used as directed. Proper and safe storage, use and supervision of all household products can substantially reduce accidents in the home, said Nancy Bock, SDA Vice President of Education, and Chair of the National Poison Prevention Week Council. The 45th observance of National Poison Prevention Week takes place March 19-25, 2006. "Take away the opportunity and you’ve automatically made your home safer by reducing the chance for an accidental poisoning when small children are around," said Bock. The independent consumer research study was completed in December 2004, on behalf of The Soap and Detergent Association (SDA), by International Communications Research (ICR). The initial survey question was asked of 1,021 American adults (509 men and 512 women). The subsequent data is based on responses given by 657 individuals who indicated they had used a wipe product. The survey has a margin of error of plus or minus 3.8 percent, unless otherwise noted.